0.1 What is charity: water? 1 Why auction the OnePlus X Ceramic? 2 How does the auction work? 3 What will I receive if I win? As OnePlus is about to celebrate its second anniversary, we want to make sure we are also taking the right steps to make positive change in the world. We’re back with a new eBay Giving Works auction, but this time we’re upping the ante. 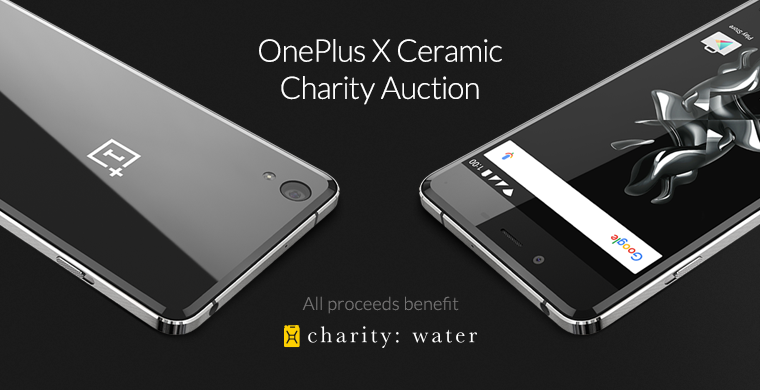 To kick off global sales of our limited-edition OnePlus X Ceramic version, we are auctioning off 5 actual ceramic devices – not just invites! – and all proceeds will go to charity: water. Visit our eBay collection and put in your bids to get your hands on one of the very first OnePlus X Ceramic phones. More importantly, help us to support the amazing work that charity: water does around the world. charity: water is a non-profit organization working to bring clean and safe water to more than 663 million people (that’s 1 in every 11 people in the world) without access to something that many of us take for granted every day. They focus on solutions that help people right here and right now: wells, filters, rainwater catchments, health education and more. Why auction the OnePlus X Ceramic? The OnePlus X Ceramic is a very limited edition of our most recently launched device. Zirconia ceramic is a difficult material to work with, but that’s why we decided to take on the challenge. About 20% of the ceramic backs we produce pass our rigorous quality tests, and only 10,000 units of this smartphone will be in existence. Therefore, we hope we can do our part to help others by kicking off our global sales of this limited edition phone in partnership with charity: water. It’s as simple as bidding on any eBay listing – simply visit one of our OnePlus X Ceramic auctions, log in to your eBay account, and place your bid. The auctions will last five days, and bidding starts at $0.99. All auction winners will receive their OnePlus X Ceramic, as well as a physical OnePlus X Ceramic invite to share. The highest bidder of the five auctions also wins a very special surprise. Everyone deserves access to safe, drinkable water, and we’re very excited to work together with charity: water (and you!) to help them in their goal. Your donation will do wonders. Bid now! Please note that the OnePlus X Ceramic will only be available in Europe, India, and Hong Kong. If a winner from the auction is not located in one of these regions, they will receive the European version of the OnePlus X Ceramic.